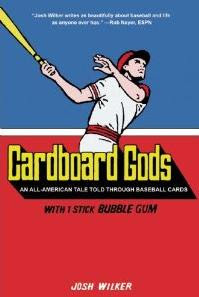 Last month you may remember that I received an reviewed advance copy of the book "Cardboard Gods" by Josh Wilker author of the blog of the same name. The publisher was nice enough to provide a hard cover version for me to giveaway. All you have to do to be eligible to win is to leave a comment answering this question. When you close your eyes and think of baseball cards, what is the first card that comes to mind? That's it. I'll take entries until next Friday night at 10pm CST. The first thing I see is a picture of the first card show I attended. 1963 Carl Yastrzemski--I can see it, I just can't reach it. Like I mentioned on the show last night, I can see a 1983 Topps Alfredo Griffin card that I received in my very first pack. The pack was uninspiring until I saw that card. I've been hooked ever since. Hmmm...the first thing I see? The 08 Jeter with Bush in the background. Don't ask me why, as I couldn't really tell you, but even I am a little freaked out by it. The first thing I see is 1979 Topps. That was the first cards I ever bought. I still love that set. 1986 Topps Cecil Fielder. Don't ask me why. It just is. 1985 Dwight Gooden Topps Rookie that my friend Ryan had...I was so jealous of that card as a kid. Now I can get it for 38 cents on line. Why? First pack I ever opened had that card on top, and for the next 10 years I collected him. Amazingly enough, I do have a memory of a baseball card as well. My great uncle had a huge collection of them. When I close my eyes, I can see the display for the one card I clearly remember. It was the 1952 Willy Mays Topps #261 ( http://tinyurl.com/y5dybvy ) in a huge frame that also had one of his jerseys from back then and a signed photograph taken in around 1956 or so with my Willy Mays and my great uncle shaking hands. 1989 Topps Jose Canseco, first "single" card I ever purchased, I think I paid $1.00 for it back in '89. First card that comes to mind, 1987 Topps Sammy Khalifa. it's so cliche and overdone, but also the reason that I've been collecting for 20+ years. 1989 Upper Deck Ken Griffey Jr.
1987 Topps #749 Ozzie Smith with the wood borders. My Parents brought me the Cardinals teams set back from Busch stadium. I was 3 years old and hooked on Baseball cards!!! 1952 Mickey Mantle rc. As I bought my first 1980 price guide and think it booked a whooping #1600 back then. I think of pink gum that is hard as concrete and lost its flavor within seconds that for some reason I couldn't get enough of. I think about my 1966 Topps #466, my Bill Freehan RC. I took me many years until I finlly found the RC of my boyhood hero, at a card show in 1980. It cost me $10, but I wouls have paid anything. It completed my Freehan collection, and its the one card I will never give up, for anything. First card that comes to mind: 1976 Johnny Bench. Classic. I spent the summer of '76 chasing that card. 52 Topps Mickey Mantle. Love that card. Have the 2010 edition.